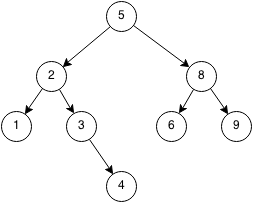 A tree map is a map which stores the values in a binary search tree. To store elements in a tree map, they must be able to be sorted by a property. To insert an element, it is added to the binary tree. To delete an element, it is removed from the binary tree. To check for membership, we do a binary search for the element in the binary tree. The advantage of tree maps is that they are maps maintained in a sorted order. Tree Maps are implemented using binary search trees. Since the implementation of a tree map is very similar to the implementation of a tree set, it will left as an exercise. Implement a Tree Map using the code of Binary Search Tree and Hash Map as guides.